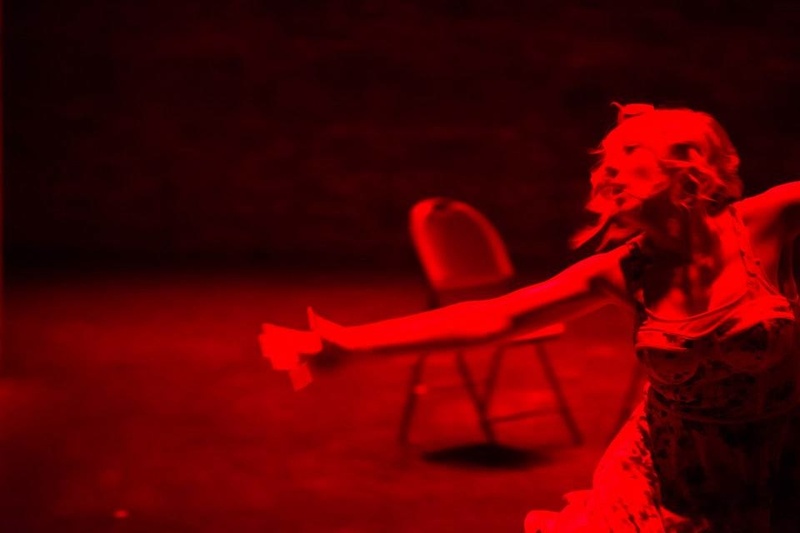 With a beautifully Gothic back wall reminiscent of a forgotten basement or dirty bedsheets, the Ritz Proscenium in Northeast Minneapolis was the perfect place to house Erin Sheppard’s latest theatrical endeavor at the Minnesota Fringe Festival: Dance with the Devil. With a soundtrack dwarfed in excellence only by its seven dancers (Erin Sheppard, Coralee Kaivo, Rhett Romsaas, Caroline Sable, Regan K. Saunders, Jessica Schilling, and Rob Ward) and one storyteller (Rita Boersma), Dance was a memorable experience. Sheppard has been dancing on and off since she was a child, quitting formal dance training at age 16 only to return to it 10 years later. 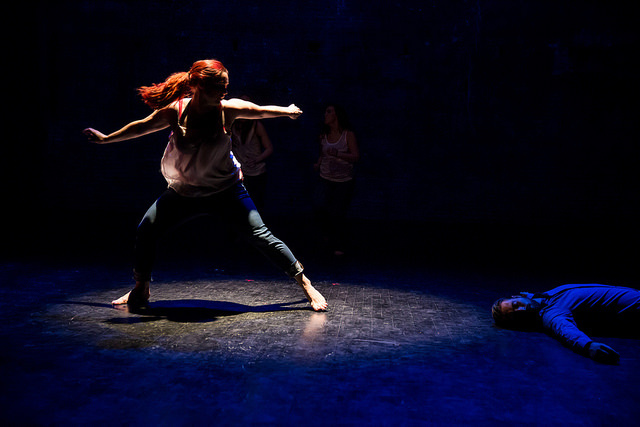 Later still, she created Erin Sheppard Presents, her dance company, out of necessity when she was told she needed to create a company to submit her work to a festival. She works with a variety of choreographers—in this case, Romsaas, Schilling, and Saunders—to create her shows. 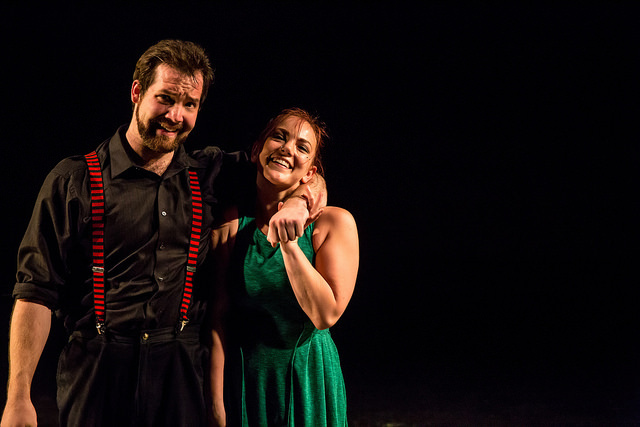 Originally brought to the stage as part of the Twin Cities Horror Festival (TCHF), Dance with the Devil is another prime example of Sheppard’s ability to craft a deeply emotive and unsettling show. 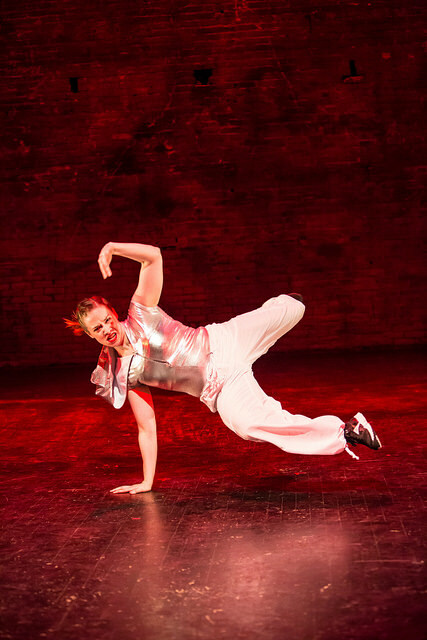 She will be returning to the TCHF this year with her newest production with Joe Bozic, Bird of Seven Colors. This show, however, particularly resonated with me due to the fact that it combines two often separated art forms: dance and storytelling. 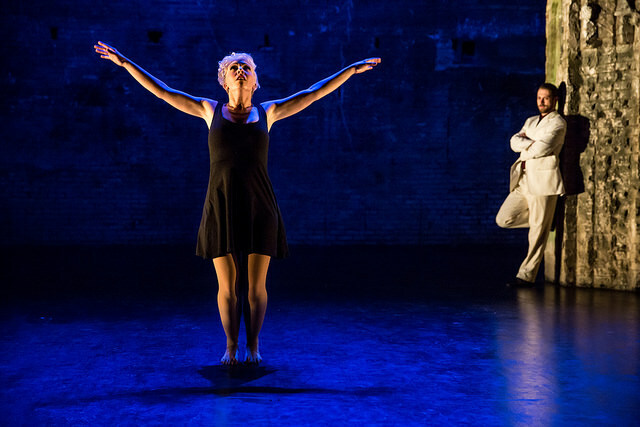 The dancers of Dance performed a combination of empowering and deeply unsettling numbers, flanked at times by Romsaas as the Devil, and Boersma told intimate stories about her upbringing and familial struggles in between numbers. The overall impact was not insignificant. “The idea of the devil-as-trickster or genie resonated with me—sure, you may get what you want, but at what cost? What is the trick of it: if you envy someone and wish for their life, what if you actually got their life?,” Sheppard asked, discussing the idea behind Dance. In the interest of full disclosure, I’ll admit that I saw this show at the aforementioned Twin Cities Horror Festival and have been impatiently hoping for video footage of the performance ever since. When I learned that the show was returning to the stage for Fringe, I was admittedly ecstatic. Just like last year, every dance number was a truly remarkable showcase of the dancers’ talents—from a haunting number wherein the they sacrifice themselves upon self-made pentagrams to resurrect their fallen lovers to a highly intimate dance between Sheppard and Romsaas in which he marks her with the red of the Devil. There is no weak link in this show, and every moment is as captivating as the next. In a show studded with performers who could carry the show on their own and probably captivate any room they walk into, it’s difficult to identify the standouts—but I do have a few favorites. First, Ward, who only performs in three of the seven numbers, has a moving number wherein he earns the attention of Sable, his love interest, with the eventual help of the Devil. He gets more than he bargains for, though, when Sable becomes obsessive and stifling. He is eventually driven to kill her in a moment of passion, overwhelmed at her attention. The piece struck a chord with me not only because I’ve been there (well, I haven’t murdered, but I have lusted after someone tirelessly until I realized they were not at all what I wanted or who I thought they were) but also because Ward delivers an unbelievable combination of skill in both dance and acting. Every emotion was plastered across his face, from lust to exasperation. 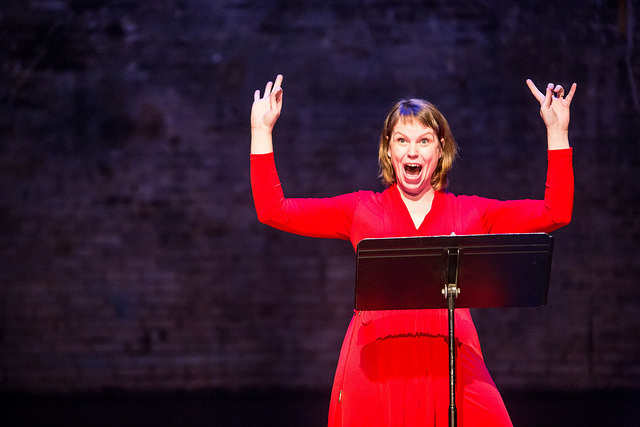 Unsurprisingly, storyteller and comedian Rita Boersma was top of the list for memorable performances. Each time she is on, she stands in the center of the barren stage alone, sharing true stories about her life, encountering evil and sin. When I watched the dancers, I couldn’t help but think to myself, “I wish I could be that”—but when I watched Rita, I thought “I am that.” Don’t get me wrong: I can’t tell stories or perform the way she can (Jesus, have you seen her improvise at ComedySportz or HUGE Theater with The Mess?!) but that doesn’t mean I couldn’t relate to everything she said. If you ask someone in the Twin Cities improv scene who their favorite improvisers are, chances are Boersma will be at the top of this list (I’ve overheard this conversation more times than I can count). 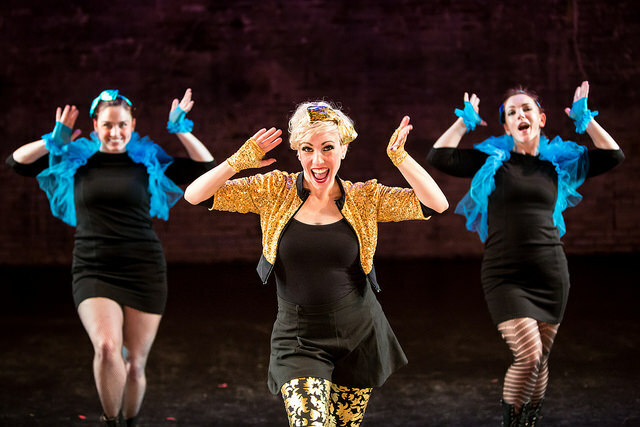 While improv itself is a form of performance that many use to channel their real-life experiences and feelings, there’s something unnerving and emotional about watching a woman who has taken on something of an improv and comedy idol role in your community bare her soul on stage. She shares her weaknesses and fears with absolute honesty, even in a story about receiving recognition for her improv itself. In a story about envy (followed by a dance sequence in which Schilling envies celebrity pop-artist Sheppard and unintentionally gets her murdered after joining her on stage), the stage lit neon green, she says: “We get so good at wanting anything but who we are, wanting anything but what we have. We get good at destroying ourselves to be like someone else . . . We are good at missing the things we might be great at.” Yes, we certainly are. Another favorite number of the night for me features Sheppard, Schilling, and Saunders artistically and expertly coordinated in an aggressive hip-hop number that channels the monster that guards the gates of hell in Cerberus. It had me moving in my seat. This is where Schilling really shined—last year when I saw her perform, she broke her nose colliding with another dancer in the dark backstage and still came on to perform only moments later, with blood running down her face as Kanye West chanted “Monster, Monster” over the speakers. While I hate to revel in someone else’s pain, the irony of the moment wasn’t lost on me, and it was pretty incredible to witness. She was equally good this time around. When asked what she thinks would resonate with audiences most, Sheppard instead shared her hope that “people feel immersed in what is happening on stage and walk away thinking about their own temptations and experiences.” And if that’s the goal, the goal is met. I have thought long and hard about this show over the past year and let it affect me in ways that I am embarrassed to admit. If I’m being honest, I have been unable to make it through this show without cackling loudly—but also without tears. There are a whole slew of incredible performances to choose from at Fringe (174, to be exact) and I am only seeing six of them. But as far as I’m concerned, if you can only see one performance at Fringe this year, let it be this one. Thursday, July 30 @ 5:30 p.m.
Wednesday, August 5 @ 7:00 p.m.
Friday, August 7 @ 5:30 p.m.
Saturday, August 8 @ 4:00 p.m.
All performances at the Ritz Theater Proscenium in Northeast Minneapolis. Tickets are $14 + $4 Fringe button (button is a one time purchase and can be used at all Fringe shows). All photos taken by Dan Norman, courtesy of Dance with the Devil. This sounds like a piece to not miss. I am sensing a date night next weekend.